Bass Rocks Ocean Inn 107 Atlantic Rd Gloucester, MA 01930 978-283-7600 . Elegant bed and breakfast accommodations in Gloucester`s historic district. An elegant Victorian B&B located minutes from the beach and village. Lanes Cove House 6 Andrews Street Gloucester, MA. 978-282-4647. Samarkand Inn 1 Harbor Road, Gloucester, MA 01930 Tel. 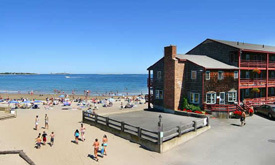 978-283-3757 - On Good Harbor Beach.